Fishing for kahawai at the mouth of Canterbury’s Waimakariri River. Here are some top kahawai fishing tips you can put into action this summer. The humble kahawai pound for pound is one of the best fighting fish in the sea. In this article, we share some great kahawai fishing tips to get you started. Although many anglers fish for them at river mouths with heavy ticers armed with treble hooks if you are looking for real excitement try fishing for kahawai on light spinning gear. When kahawai are present at the beach or river-mouth in good numbers you don’t need to cast all that far to hook them. I have often fished for kahawai with the same long fishing rod and Abu Ambassadeur 7000 reel I use for salmon simply because I usually fish at river mouths for both species and it saves carrying another rod and reel. However. after having experienced fishing for kahawai on light tackle I now prefer to carry the second outfit as well whenever I can. Kahawai fishing on light gear is tremendous fun. If you haven’t tried it yet you don’t know what you are missing! 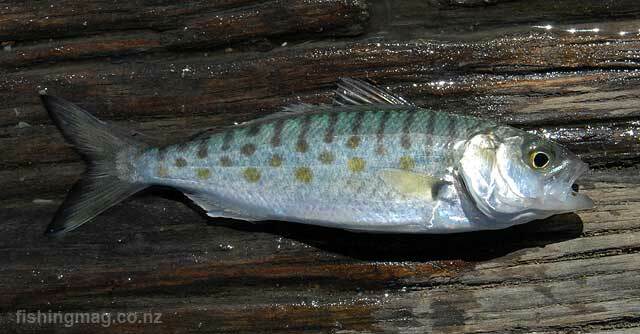 Juvenile kahawai measuring 150mm caught and released in the Marlborough Sounds while fishing for mullet. 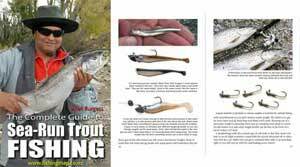 The best gear to use is the same spinning outfit you would use for trout fishing. This is generally a rod of about seven feet matched with a light eggbeater reel, and six-pound monofilament. Nowadays of course braid is all the rage. It is so much better than mono because of the absence of line stretch and its fine diameter casts well and cuts through the water with little drag. I top-shot my reel with two rod lengths of monofilament to the end of the braid for trout fishing. I just use the same rod and reel I use for trout fishing in rivers, lakes, or the Twizel Canals when targeting kahawai. Kahawai taken on a green and silver salmon ticer. That’s a good kahawai fishing tip; kahawai like green and silver ticers. Rather than using a 55 or 68g ticer (hex wobbler) try fishing with a 20g silver jig shaped like a fish. The best ones are flattened on the sides. You will also find a single hook to be more effective than a treble at holding the kahawai. The silver metal jigs are available in good tackle stores. Get some weighing around 15 to 20g. As they are quite compact they cast much further than Tobys, or small ticers, of an equivalent weight. You will get more hook-ups with the silver jigs and single hooks on kahawai than you ever will using salmon ticers and trebles. The next question must be where do you find these kahawai. If fishing from a boat the answer is where ever birds are working. When you spot a school of kahawai don’t run your boat into them. Instead stay back a bit otherwise you will only succeed in putting them down. When shore fishing for kahawai the birds are still important at letting you know where the fish are. You get big schools of kahawai working along the coast of the South Island during spring and summer. The kahawai are working schools of pilchards, sprats, smelt and other baitfish. Schools of pilchards and sprats moving north are followed by kahawai and other predators. At times, particularly in late spring, kahawai feed on vast clouds of surface whalefeed (small red coloured crustaceans) when these are present. Keith Chin with a good kahawai from the Waimakariri River mouth. The bait schools and kahawai are often found right in the breaker line. As the baitfish try desperately to avoid their pursuers they will often beach themselves rather than be eaten by kahawai. Any sprat or smelt washed onto the beach is quickly consumed by the noisy squawking gulls and terns that invariably accompany this moving banquet. For the shore based angler fishing at the beach it is simply a matter of waiting for this mass of sea-life to happen along. At certain places over summer, like the Kaikoura coast, this will often happen daily. Sometimes the schools will sit frustratingly within sight yet well out of casting range. When the kahawai do get close enough to the beach you can easily hook them on every cast. It is always incredibly exciting. The screaming sea-birds simply add to the general mayhem and exhilaration as kahawai leap clear of the water trying to toss your lure. This is a top kahawai fishing tip. A plain silver fish shaped lure is one of the best there is for kahawai spinning. These are excellent on kahawai in the surf. It is a 28g Grim Reaper with a single hook. It is compact and good for casting a long distance. Fewer kahawai seem to get off single hooks than they do from trebles. Another of our kahawai fishing tips is to have a spare spinning rod all set up and handy at all times. When camping at the beach over summer at Kaikoura, and other places, you have to be ready for the schools when they come into casting range. Have your rod and reel set up with a lure tied on. When the kahawai schools arrive they won’t be staying for long. Usually they move along the beach at a walking pace. By the time you have caught a fish or two they have moved further along the beach. At Kaikoura I have headed them off by driving north along the beach. They are just as likely to move back out to sea as they are to move along the beach so chasing them doesn’t always work. I have had good success following them along the beach at South Rakaia on my quad bike, stopping, casting, catching one or two, before hopping back on the bike. Another good place to find kahawai is at river mouths where they can sometimes hold up for weeks, or even months, feeding on smelt, and other bait-fish. Kahawai will often disgorge their stomach contents when hooked so it can be difficult to know exactly what they have been eating. At the mouth of the Waimakariri River, on the Canterbury coast, schools of kahawai can sit out in the breakers all summer. The bottom is sandy and the river-mouth can be very wide at high tide. When wind and tide are right you can fish for kahawai quite easily. This is the perfect spot to target them on the light weight spinning gear we discussed earlier. With a 4×4 truck, you can drive all the way to your fishing spot. Kahawai often travel into the tidal reaches of rivers and at times can be caught well upstream. I have successfully fished for kahawai at many river-mouths. One place to target them is in the tidal lagoons that form just inside the mouths of many of New Zealand’s rivers, as well as the channel, or gut, where the river exits into the sea. Each river is a bit different depending on flow rate and size. Above all watch out for the sea-birds. If they are diving into and circling close to the surface there are sure to be kahawai present. Here is another of our kahawai fishing tips to remember. Use a 2/0 single hook and you will hook and land a lot more kahawai. Fewer kahawai seem to get off single hooks than they do from trebles. You would think that a treble hook, with three barbs, would give you three times as much chance of hooking a kahawai as a single hook. Perhaps surprisingly not so at all. Try the singles you may be surprised at how well they work! Silver and red metal jig kahawai lure. Fishing is one of New Zealand’s most popular recreational activities. It’s important for all fishers to act responsibly and help conserve the resource. Bag limits for kahawai and other fish species differ throughout New Zealand’s seven main fishing areas. For example the maximum daily limit per fisher for kahawai in the Kaikoura Area is 10. Whereas in the South East Area (Canterbury) the maximum daily limit per fisher is 15. It is your responsibility to know the limits. Check it out including: fishing methods and bag limits for Rock Lobster, Shellfish, and Fin Fish here at the MPI – Ministry for Primary Industries website. Note you can download .pdf files from this MPI website so you can check bag limits and permitted fish lengths for the areas you fish – even if you can’t get cellphone reception. Here is a great video about how to fish for kahawai on light gear with Malcolm Bell from The Complete Angler. There are heaps of great tips in this video for the spin and fly angler. Highly recommended.